Get Instant Access to BIM Data. Start Your Structured Evaluation Today! 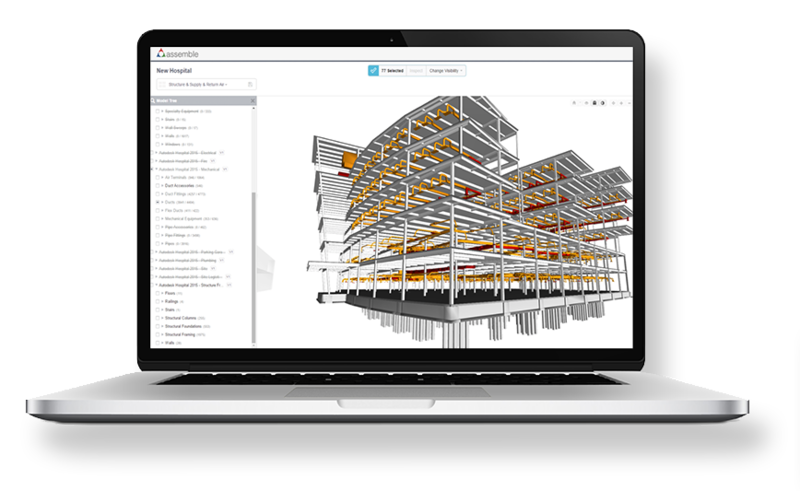 Assemble transforms how BIM data is accessed and used for construction management. Our team of engineers will help you get more from your VDC initiative by spreading powerful 3D viewing to your field operations as well as other areas of your company. In a free 3 week structured evaluation, you will discover how project teams can easily access, manage, and share BIM data faster than ever. Automate model-based quantity takeoffs and change management. Assemble provides comprehensive model inventories and the ability to identify model changes in minutes. Customize and transform model data into actionable information to support real-time decisions and share that information anywhere and anytime. Expand the use of BIM data through the project team, no Revit knowledge required! Assemble’s construction data management solution is ideal for general contractors, preconstruction estimators and BIM/VDC Managers. Use Assemble throughout design, preconstruction and construction for improved project outcome. Assemble offers a new way of model checking and value verification that results in data you can count on. From tracking design trends, budget, level of development to production and scheduling, Assemble is the only solution that delivers. To take advantage of a free 3 week structured evaluation! Just fill out the form below.